Objective of the Technique: To introduce a novel technique for mesh placement during laparoscopic GPH repair. 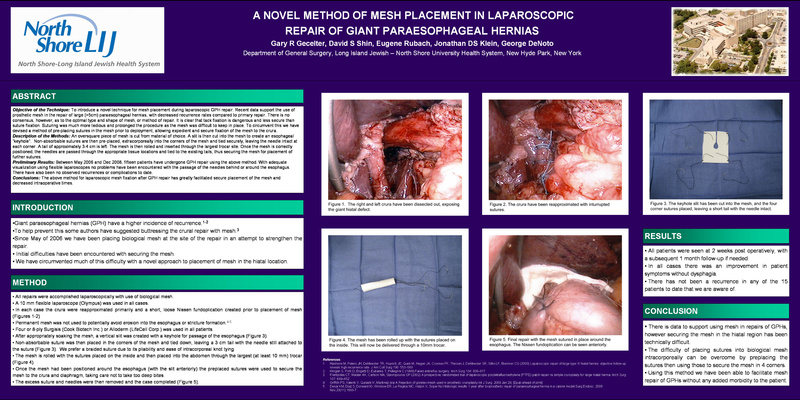 Recent data support the use of prosthetic mesh in the repair of large (>5cm) paraesophageal hernias, with decreased recurrence rates compared to primary repair. There is no consensus, however, as to the optimal type and shape of mesh, or method of repair. It is clear that tack fixation is dangerous and less secure than suture fixation. Suturing was much more tedious and prolonged the procedure as the mesh was difficult to keep in place. To circumvent this we have devised a method of pre-placing sutures in the mesh prior to deployment, allowing expedient and secure fixation of the mesh to the crura. Description of the Methods: An oversquare piece of mesh is cut from material of choice. A slit is then cut into the mesh to create an esophageal “keyhole”. Non-absorbable sutures are then pre-placed, extracorporeally into the corners of the mesh and tied securely, leaving the needle intact at each corner. A tail of approximately 3-4 cm is left. The mesh is then rolled and inserted through the largest trocar site. Once the mesh is correctly positioned, the needles are passed through the appropriate tissue locations and tied to the existing tails, thus securing the mesh for placement of further sutures. Preliminary Results: Between June 2006 and May 2007, twenty-one patients have undergone GPH repair using the above method. With adequate visualization using flexible laparoscopes no problems have been encountered with the passage of the needles behind or around the esophagus. There have also been no observed recurrences or complications to date. Conclusions: The above method for laparoscopic mesh fixation after GPH repair has greatly facilitated secure placement of the mesh and decreased intraoperative times.